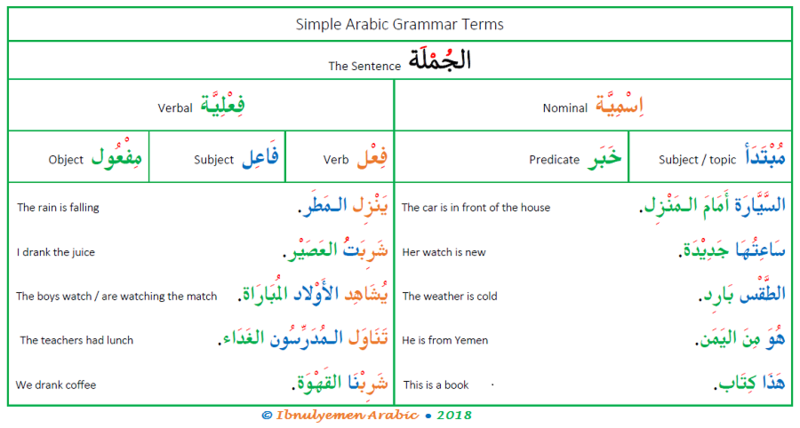 This lesson reviews the Arabic grammar terms that you encountered in the previous lessons. It includes a list of the terms. Each term is explained. There is are examples for each. A word that can be a subject فَاعِل, a topic مُبْتَدَأ, a predicate خَبَر, an object of a verb مَفْعُول, or an object of a preposition اٍسْم مَجْرُور. A noun that does not refer to a specific entity. A noun that refers to a specific entity. A نَكِرَة is made مَعْرِفَة by prefixing ال (i.e. الخَطَر) or suffixing possessive pronoun ضَمِيْر مِلْكِيَّة (i.e. كِتَابُهَا). A noun that denotes a male. A noun that denotes a female. It usually ends with ـة. So, most masculine nouns are changed to feminine nouns by adding the feminine prefix ـة. The verb the root of which does not include a weak vowel. The verb the root of which includes a weak letter. It is irregular because its root changes when conjugated. The verb the root of which can include three, four, or five letters. None of these letters can be dropped as they are essential to its meaning. If [alif] is dropped from صَام, the remainder صَمْ has no meaning. The verb the root of which includes one, two, or three additional letters. If the additional letter(s) is/are dropped, it still has related meaning. If the [alif] is dropped from شَاهَدَ, the remainder شَهِدَ still has meaning that is related to شَاهَدَ. The verb that does not need an object مَفْعُول. It with the subject فَاعِل form a complete sentence. The verb that needs an object مَفْعُول to form a complete sentence. That is, without an object, it does not form a complete sentence. It is the past form of the verb. It is the present form of the verb. The verb that is composed of three letters. The verb that is composed of four letters. In شَجَّعَ, the ج is doubled, i.e. ـجَّـ = ـجْـجَـ. The verb that is composed of five letters. In تَكَلَّمَ, the ل is doubled. The verb that is composed of six letters. It is the pronoun that can stand alone, i.e. not attached to another word. You will learn about the dual pronouns in future lessons. It is an attached pronoun that is added to the end of nouns to denote ownership. It is the subject attached pronoun that is appended to the verb to denote the subject / doer. It is the object attached pronoun that is appended to the verb to denote the object. If added to a preposition, it is its object اِسْم مَجْرُور. It is a subject pronoun that does not appear on the verb. Instead, it is implied and can be inferred from the prefix on the verb. A preposition that is always followed by a noun / pronoun. A noun or pronoun with which we start the nominal sentence (see below). It is usually definite مَعْرِفَة. It is a proper noun, a noun, an adjective, or prepositional phrase (see below) that complete the nominal sentence. If it is a noun or an adjective, it is always indefinite (except pronoun nouns and nouns with attached possessive pronouns). Generally, it is a preposition followed by a noun. Words like خَلْفَ and تَحْتَ are referred to as an adverb ظَرْف in Arabic. It is sentence that starts with a noun. it has two parts: a subject / topic مُبْتَدَأ and a predicate خَبَر. It is a noun / a proper noun that functions as the subject / doer of the verb. It is a noun / a proper noun that functions as the object / receiver of the action. It is a sentence that starts with a verb. It is composed of a verb and a subject (with the intransitive verb) or a verb, a subject, and an object (with the transitive verb).